As a catering service, we work alongside the Soil Association to ensure our meals are locally sourced, sustainable and honest food cooked by our Kitchen staff. 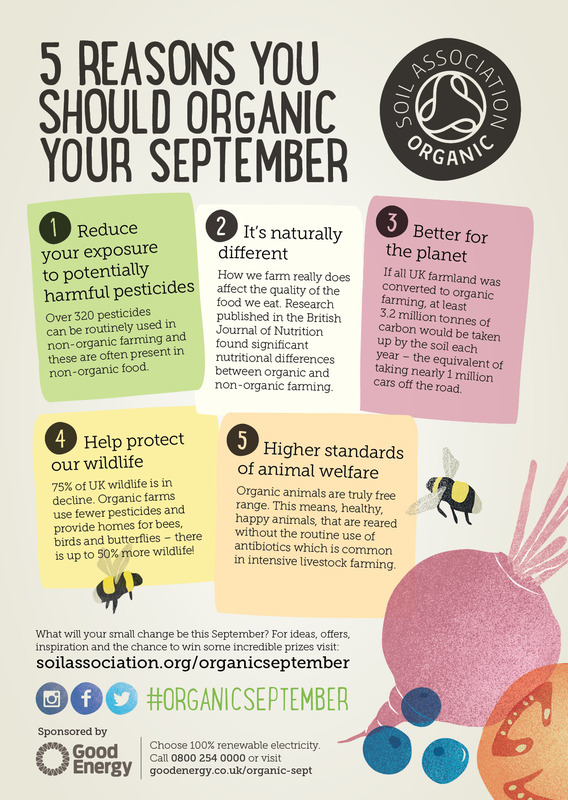 The Soil Association in September will be promoting why we should all buy organic produce, and why should we? The pesticides in non-organic food production can pollute our waters and the environment. Many pesticides used in this production do not just kills weeds, but can impact our wildlife too. Organic farms only use natural substances from plants rather than chemicals to prevent pests and diseases, using less energy and are more respectful to wildlife and our environment. Organic meats mean that our animals are a lot happier and healthier! This means that their feed is as natural as possible and they are not fed food in order to bulk the animals up for their meat. There is plenty of space for the animals to live and grow, to reduce the amount of stress and disease. Organic Farms help look after our wildlife, on average plants, insects and bird life is 50% larger on organic farms, and are they home to 30% more species. Organic food means our produce is more natural and was produced in a strictly controlled environment, therefore you should be able to trace it from the farm right to your fork. Studies have found that… Organic milk and meat containing around 50% more omega-3 fatty acids than non-organic and slightly lower concentrations of two saturated fats. Organically produced such as grains, fruit and vegetables crops have been found to have up to 68% more antioxidants than non-organic. Organic farming helps a healthy living soil that is more resistant to drought, floods which impacts climate change. We have to protect our soil as it’s a non-renewable source; therefore it needs protection for food security and sustainable sources of food in the future. Not only this, but healthy soil is a major store of carbon for example, it can contain three times the amount of carbon that’s in our atmosphere. As a catering service we care about our environment and where our food comes from. We believe that foods we consume should be traceable. Currently in our school meals, we use a range of different organic ingredients on our menu which range from, Beef, Pork to pasta, carrots and much more. We don’t only supply your children with organic produce but other foods certification to ensure our menu is sustainable such as MSC fish, Fairtrade Bananas and Free Range Eggs.